For nearly 33 years, Montgomery resident Judy Bressler Williams was left to ponder what happened to some of her family’s most prized possessions. On May 23, 1986, while Williams and her family were en route to a family vacation, their house caught on fire, later determined to be an act of arson. Though her home was not completely destroyed, items in a jewelry box containing her Virginia high school and Huntingdon College class rings, charms, husband’s cufflinks and most importantly, a French-made necklace purchased in Paris by her father for her mother during WWII, were gone. “I looked all around that night, and afterward, thought to myself, ‘I’ll probably never see them again,’” Williams said. However, in mid-March she was surprised to find out she was wrong. 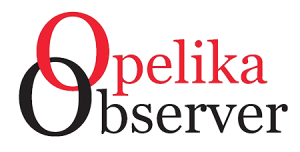 A recently broken spillwell on Opelika’s Lake Forest has resulted in severely decreased lake levels. Cindy Cannon, who was hosting her grandchildren Christopher and Carter during their spring break, tasked them with exploring the lake bottom to see what they could find with a metal detector. While examining the Huntingdon class ring, Cannon found the initials “J.B.” and “Class of 1970,” clues that she turned over to friend and neighbor Judy Mardre. 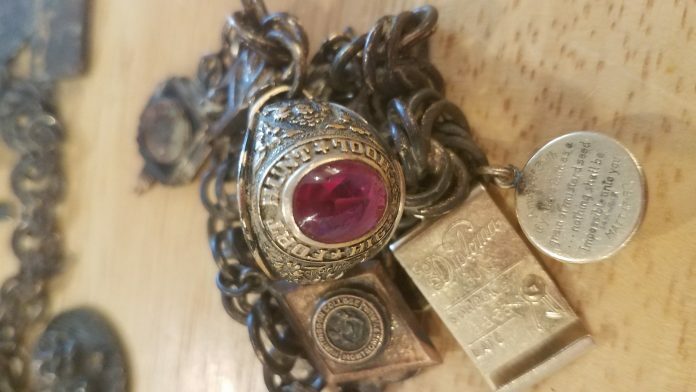 Through a quick online search and finding Williams’s mother’s obituary, Judy’s daughter and Huntingdon alumna Mari was able to help Cannon crack the identity of the missing jewelry’s owner. Later that day, Cannon called Williams, eager to share the good news. “I didn’t recognize the number, so at first, I thought it was a solicitor. But I ended up picking up anyway,” Williams said. “I told (Williams) that I thought we had found some jewelry that belonged to her, and she said, ‘what? How do you know that it’s my jewelry?’” Cannon said laughingly. Last Monday, Williams and her husband made the trip to Opelika to retrieve the jewelry, with most pieces still retaining their beauty even after being covered in mud for nearly 33 years. She said she plans to have some of the pieces refinished in the coming weeks. Mystery still surrounds the finding of Williams’ belongings being found more than 50 miles away from home, where they were being taken to and why the thief would drive so far out of his way to dispose the jewelry. In any case, Williams said she is still incredulous that these pieces were found. “It’s just really, really special … never in my (wildest) dreams did I think this would happen,” Williams said.